Graz, with 0.3 Mio inhabitants Austria's second largest city and capital of the State of Styria, was Cultural Capital of Europe in 2003. It has four universities with about 50,000 students and is also host to numerous spaceflight-related R&D endeavours. Graz stands out from all the cities of comparable size in Europe: As a Habsburg's residence, it was once the centre of the Holy Roman Empire. A university city since 1585 - after Kepler, numerous scholars, including several Nobel Prize winners, made Graz into an intellectual centre at the southeast edge of middle Europe. History has touched upon Graz a few times: Attacks of the Ottomans are handed down (thanks to the defensive measures taken, Graz today houses the largest historical weapons and armours collection in the world, the armory or Zeughaus). Around 200 years ago, Napoleon's troops besieged the city. On the personal order of Napoleon, the fort on the Schlossberg was razed to the ground after a negotiated handing-over of the fort. The history of Graz is connected to the physicist and astronomer Johannes Kepler, who is now chiefly remembered for discovering the three laws of planetary motion that bear his name published in 1609 and1619. He also did important work in optics (1604, 1611), discovered two new regular polyhedra (1619), gave the first mathematical treatment of close packing of equal spheres (leading to an explanation of the shape of the cells of a honeycomb, 1611), gave the first proof of how logarithms worked (1624), and devised a method of finding the volumes of solids of revolution that can be seen as contributing to the development of calculus (1615, 1616). Moreover, he calculated the most exact astronomical tables hitherto known, whose continued accuracy did much to establish the truth of heliocentric astronomy (Rudolphine Tables, Ulm, 1627). At Tübingen Kepler was taught astronomy by one of the leading astronomers of the day, Michael Maestlin (1550 - 1631). Maestlin persuaded Kepler to abandon plans for ordination and instead take up a post teaching mathematics in Graz, and Kepler carried out his scientific work while he was teaching here. Today one knows Prague and Linz as 'Kepler cities', whereas the famous scholar's time in Graz remains largely unmentioned. The fate of Graz: often sold below its value. Graz has many stories to tell. The Old Town is one of the best-preserved in Central Europe, bespeaking the wealth of heritage dating back to this period. There also is the tale of romance: courtyards tucked away in the city centre, Renaissance buildings, a Mediterranean feel. And finally a tale of contrasts: classical music and jazz, tradition and modernism, literature, and a multitude of art festivals. Graz is a point where many cultures meet: East and West, the Alpine and the Mediterranean regions. Its charm is immediately evident to its visitors. Being an old city, at the same time it maintains a very youthful atmosphere, in part because of its universities and high-tech enterprises, including companies successfully dealing with space technology. In 1999, the UNESCO raised the Altstadt (historical city centre) of Graz to a World Heritage Site. The dense coexistence of buildings from all epochs of art history - from the Roman to the Gothic, the Renaissance, the Baroque, Mannerism, Classicism, up until Art Nouveau - crowned by unequalled roof-scapes, invites one to take a walk through the cultural history of Europe. 'What does one see then in Paris, London, Berlin or Hamburg? People and more people and nothing but people. One has to go where humans live, who are not yet people...' Austria’s harshest satirist and playwright, Johann Nestroy, said this. Shortly after, he bought a house in Graz and retired here. He was not the only one. During the mid-nineteenth century, Graz was regarded as the 'Pensionopolis' of the imperial and royal monarchy. Whoever could afford it, settled down here, where the influence of the South, climatic as well as cultural, made itself felt most pleasantly on the people. 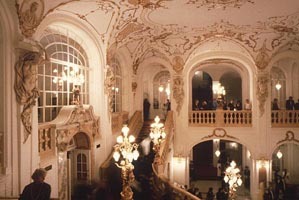 Numerous theatres and concert halls were built - as well as an opera house, designed by Ferdinand Hellmer and Ferdinand Fellner. 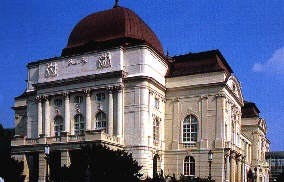 Even today, Graz is, next to Vienna, the only Austrian city with its own opera house. Graz finds itself in the middle of a central European space, which today is again growing together. 'Graz,' it says in the city’s application for the title 'Cultural Capital of Europe,' 'has, for centuries, been positioned at the intersection of European cultures. Here Romance and Slavic, Magyaric and Alpine German influences could combine themselves into a totally specific character.' Incidentally, a character in which a strong pleasure in innovation is well proven, and not only in the fields of science and economics. In the twentieth century, Graz was counted as one of the starting points of the international avant-garde - for instance with the Forum Stadtpark as the nucleus of contemporary literature and with the international festival 'Steirischer Herbst' (Styrian autumn). Hosting four universities, Graz is an intellectual goldmine. 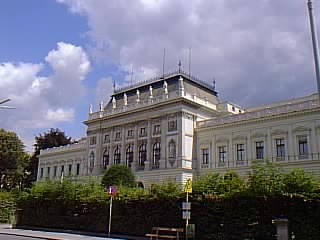 The oldest one, the Karl-Franzens-University, was founded by Archduke Karl in the 16th century. Then there is the University of Technology, the University of Arts, and since 2004, the newly established Medical University. Students from all over the world study at the various departments of medicine, economics, law, social sciences, architecture, music and many more. Taking the train may be something for railway enthusiasts. As all railroads to Graz have to cross the Alps, trains will take their time to get you to your destination. Basically, there are hourly rail connections from Vienna (ca. 2 h 40 min), Linz (3 h - 3 h 40 min), Salzburg (ca. 4 h) and Klagenfurt (3 h - 3 h 30 min). From Vienna and Salzburg about half are direct connections. At least you will be rewarded by a certainly lovely landscape. If you take the railway from Vienna (Wien Südbahnhof), you will enjoy a ride across the Semmering mountain area. This stretch of the railroad was one of the world's first and steepest pure adhesion railroads (steepest gradient 1 in 40, built in 1848-1854) and was listed as World Cultural Heritage in 1998. The main railway station is about 5 min. from the convention center. By car Graz is ideally located at the hub of Central Europe's road network. Graz can be reached taking the motorway A2 (Vienna - Graz - Klagenfurt - Italy) or the motorway A9 (Wels - Graz - Slovenia). From Graz, one can reach Vienna or Ljubljana in two hours, Triest or Zagreb in three hours, Venice in four, and Budapest or Munich in five hours.